getting their vouchers, in total disbelief that there is no catch, was wonderful to watch!” laughs Matoko. “It was a classic win-win situation for everyone!” The Makro shopping voucher Matoko refers to, had the value of R800 and was given to all purchasers of appliances on which energy efficiency labelling was mandatory, as part of the activation that day. The only proviso was that the specific efficiency grade of the purchase was no more than two down from the highest optimum efficiency standard available for that appliance type. “Energy efficient appliances no longer cost more”, points out Marcia Lephera, UNDP Project coordinator. “But where they do, we have negated the higher price via the voucher and encouraged consumers to make appliances’ energy efficiency their primary purchase decision. And the individual Makro stores gained too, with the pre-sale of vouchers to the project”, she continued. “The positive ‘vibe’ that the activation team created was just great for everyone,” Lephera concluded. 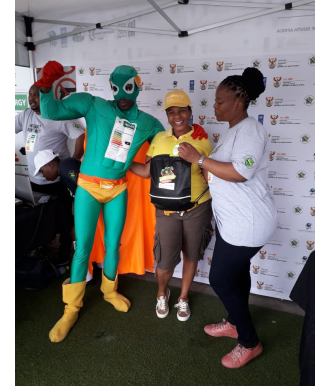 With all the fun-filled fanfare of a mardis gras moment, Makro stores across six provinces experienced the positive energy of a full Saturday’s efficiency-awareness extravaganza, as Captain Energy and a lively crew of promoters descended in full force! At the store entrance, an eye-catching gazebo and matching banners as a key focal point, with Captain Energy and an amiable, quick-witted master of ceremonies eagerly engaging with passers-by, as a hit music DJ played up-tempo vibrant songs. Here, vivacious dancers with labelling branding on their costumes crafted coordinated dance moves with both Captain Energy and the MC, while warmly interacting with shoppers, alerting them to that day’s energy efficiency voucher special and distributing an array of other branded gifts and communication material, from informational flyers and leaflets, to T-shirts, caps. Fridge magnets and draw-string bags. Within the store, at the appliance section where the final buying decisions are made, was a combination of strongly branded appliance labelling communications material and on-hand project team members with a more detailed understanding of the appliance labels and the energy calculator app, interacting with prospective customers in tandem with Makro personnel, to positively influence those decisions. Here the vouchers were a significant boon, because they bolstered facts about the long-term savings from efficient appliances, with the immediate benefit of an R800 Makro voucher for buying one. And buy they did! The pilot retail activation took place at Makro Woodmead in Johannesburg, where vouchers were valued at R600 – of which 38 were given away to buyers of sufficiently efficient appliances on promotion. Immediate consumer response to the Woodmead initiative was most encouraging; and based on its results it was decided to raise the voucher value to R800 and extend the activation ambit outside of Gauteng into large cities of other provinces, as the “Provincial Energy Saving Activations Campaign”. In the weeks that ensued, 38 vouchers were given away in Durban, 33 in Cape Town, 28 in Polokwane, 23 in Nelspruit, and 10 in Bloemfontein.